At LOW TIDE it is possible to walk along the shore to Doctor’s Point. 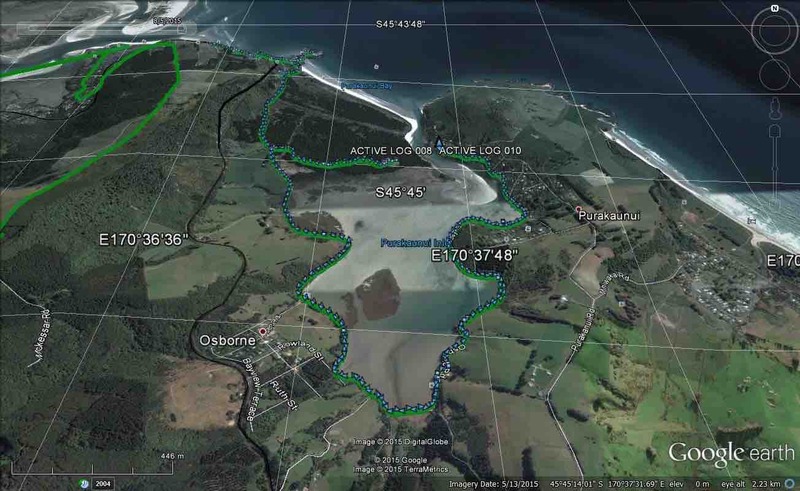 Also pleasant stroll 1 km down southeastern end to mouth of inlet with scattered cribs. 15. 8/8/2018. Trampers. 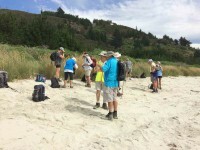 Purakaunui/Canoe Beach. 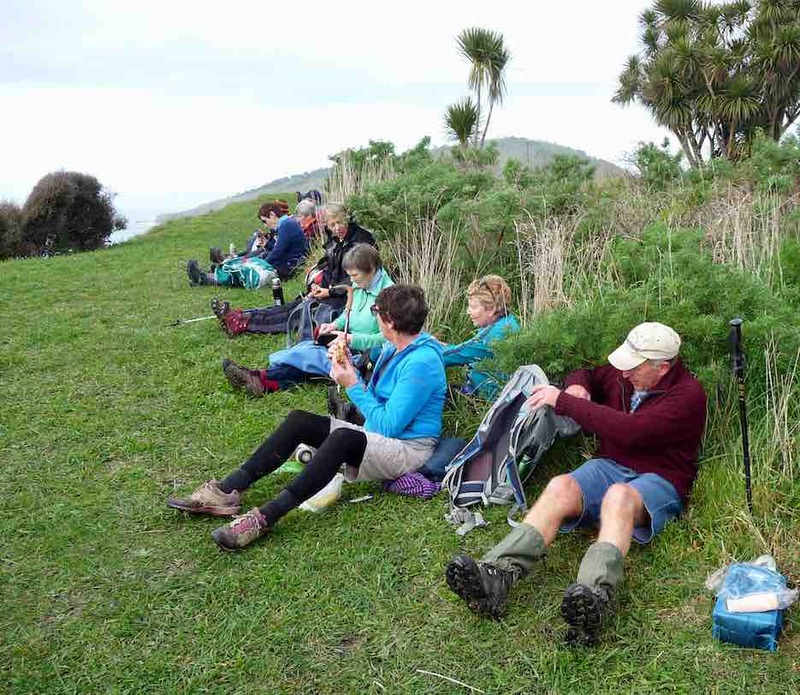 Leaders: Jill and Judy D.
Another mild winter’s day spent in the Purakaunui area. 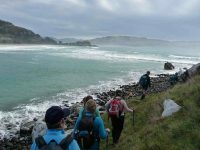 We had to change plans as high tide was approx 12 md and we had planned to walk from Doctors Point to Canoe beach before climbing the Mckessar track back to the cars. 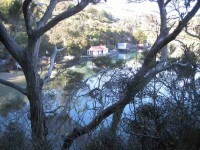 and walked along the inlet track, passing the cutest little 140 year old holiday home on the seaward side of the track. Not sure what will happen with the effects of global warming?? and up the north coast. 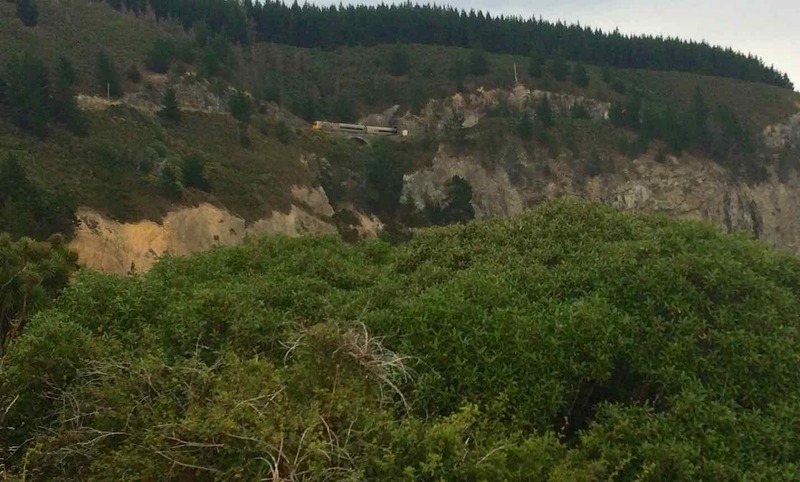 Back along the short track and up the road above the holiday homes scattered amongst the bush. There was continual birdsong along our way which was so pleasant. 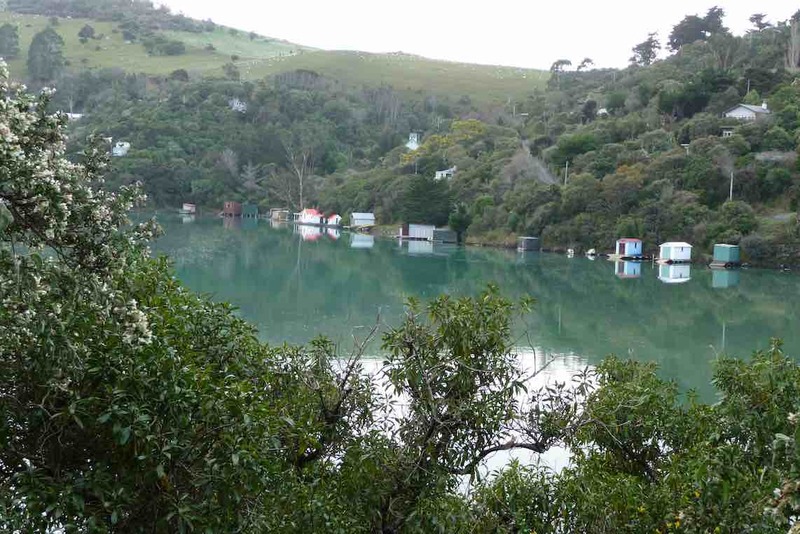 The inlet was very calm reflecting the quaint colorful boat sheds. 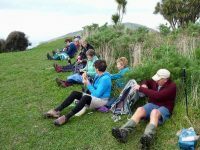 We shifted along to Osborne where we walked out to the beach and up to the old maori pa Mapoutahi where we had a leisurely lunch with uninterrupted views. 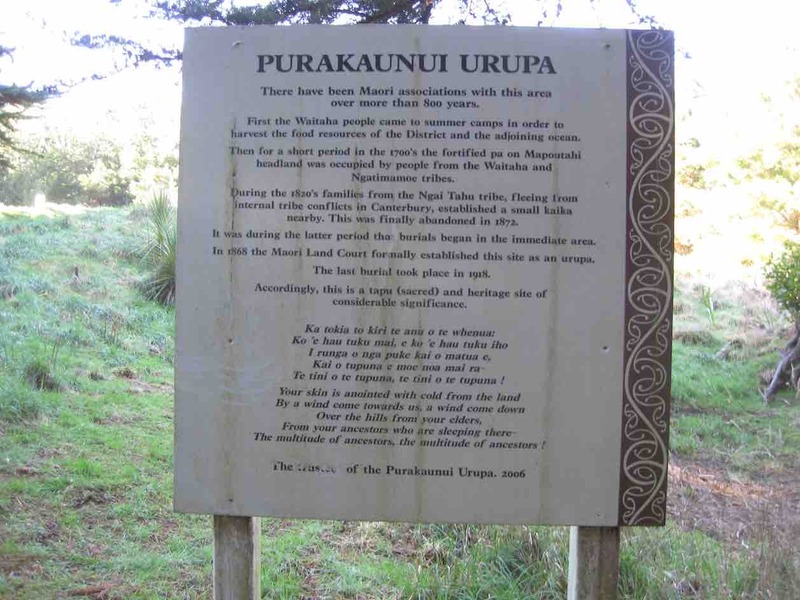 Out to canoe beach and back to Puraukanui beach to the cars. We were very fortunate to see several Kingfishers, some diving, some Rosellas and even an Eagle sitting on some scrub out in the inlet. 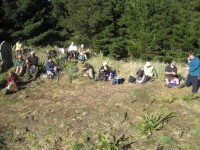 It was decided to have coffee at Orokonui Sanctuary again with pleasant views. 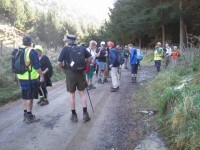 12 trampers and about 8 kms travelled! A relaxing day had by all. – Jill. 14. 24/2/2016. Hikers. 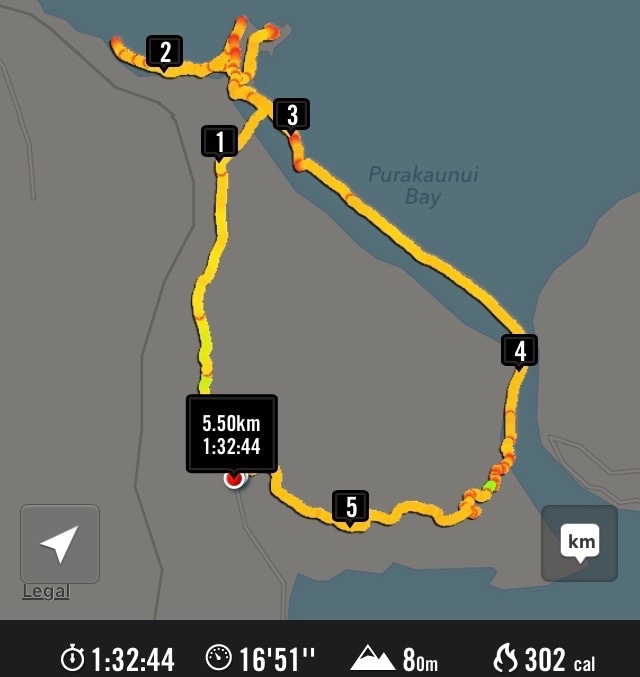 Beach, Caves, Spit, Urupu. E. Leaders: Jim and Betty. GPS route map of Hikers’ tramp. 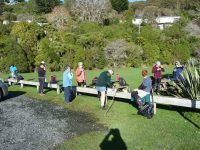 A turnout of 24 walkers enjoyed extremely good weather. 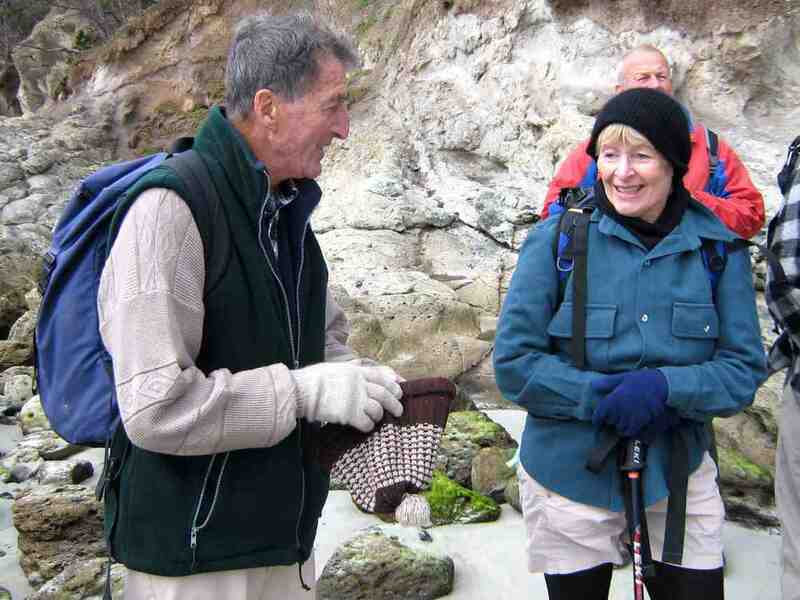 Leaders were Betty & Jim Finnie. 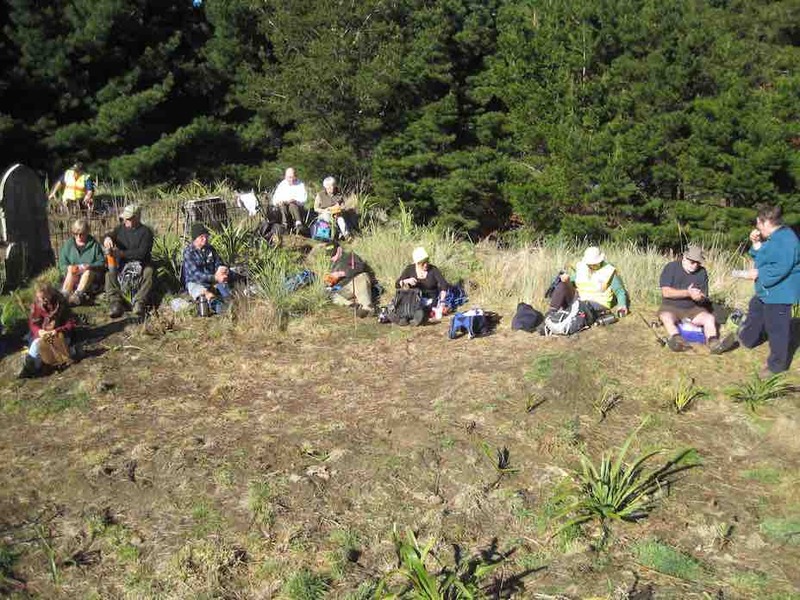 Cuppa stop on the Mapoutahi Pa peninsula. Evidence of a new sandbar is visible at top of photo. 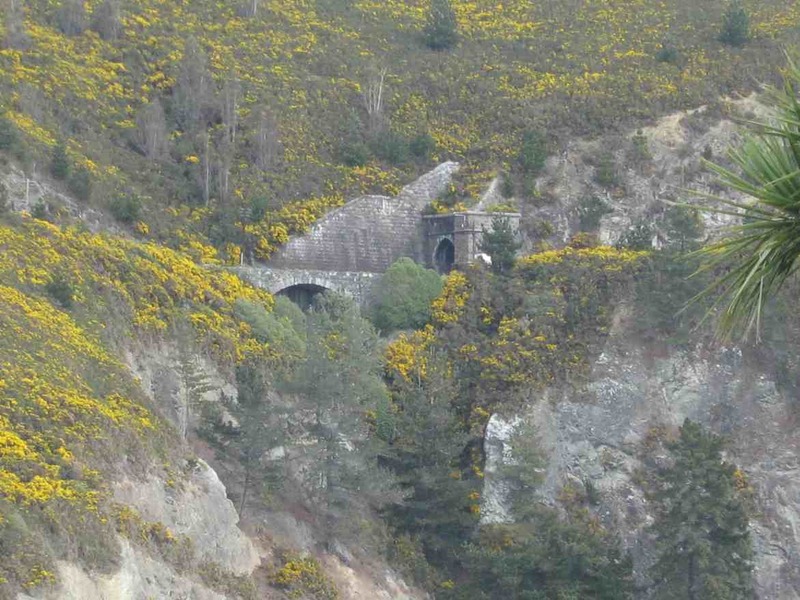 Just managed to catch the railcar before it got right into the tunnel. 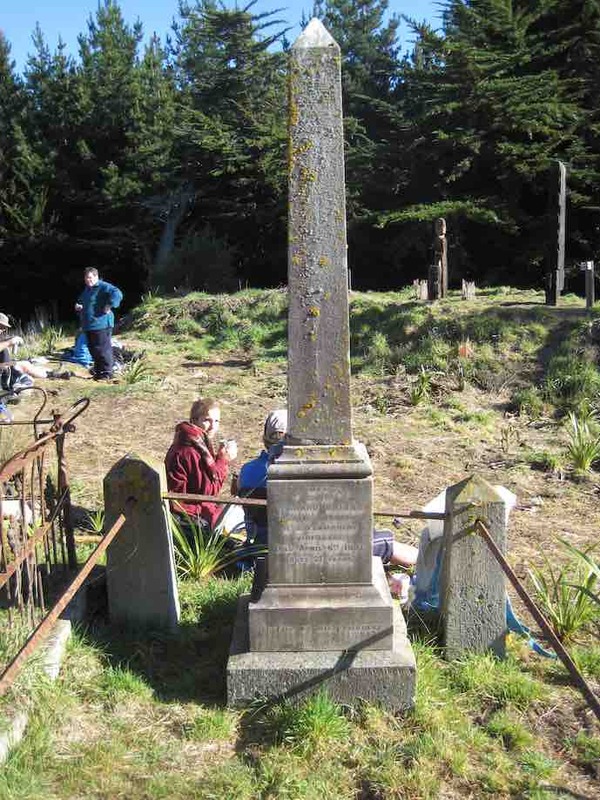 … to Doctors Point had to be curtailed due to the sea’s erosion of sand at the boulder pile. It appears that this had occurred in the last approximately 10 days. After a short delay, seven of the more adventurous walkers made the difficult crossing of the boulder pile to inspect the caves while the balance of the walkers started into the remainder of the planned walk. There was a regrouping for lunch part way along the Purakanui beach. Getting up after a lazy lunch on sand spit. 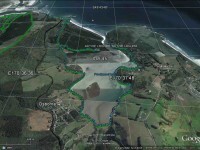 View down sandspit. Potato Point. 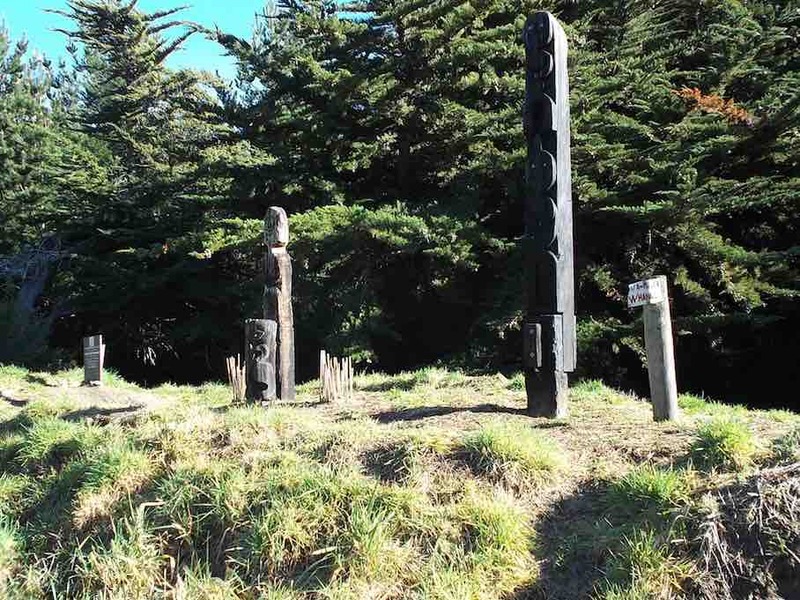 … and followed the inlet into the pine trees to the fenced Maori cemetery. 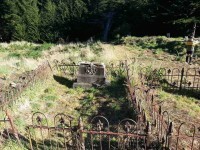 From the cemetery it was along the vehicle track back to the car park. – Jim and Betty. 13. 5/8/2015 Both. 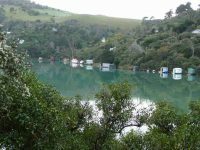 Purakaunui, Purakaunui Urupu, Doctors Point. Moderate. Leaders: Judy, Bob. GPS of route courtesy Ken. 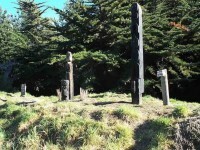 Purakanui Maori graves beach caves. (Ken pic and caption.) 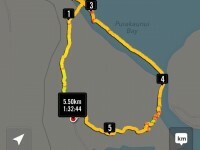 Walked 18km; 4.9km/h; 3hr 40min moving; climbed 260m. 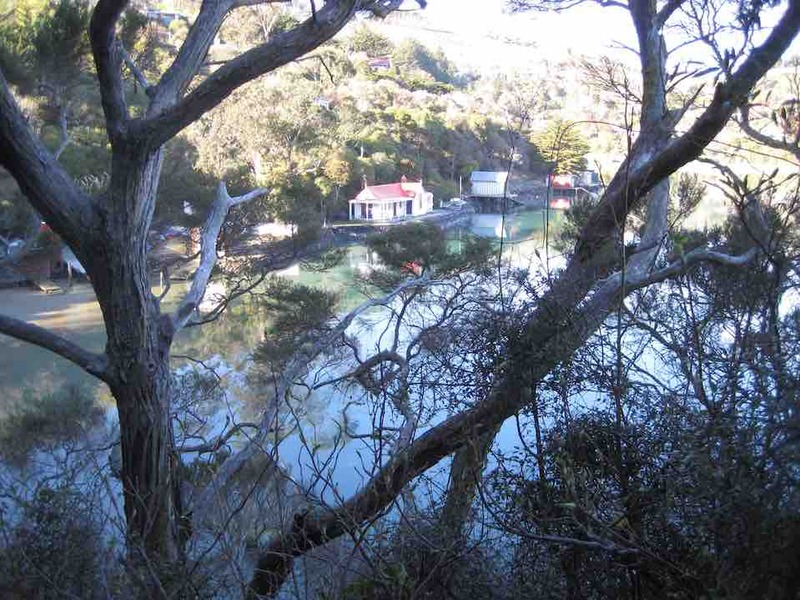 Today was a joint tramp with the hikers, so we all drove to Purakanui & parked down by the old garage at the far end. 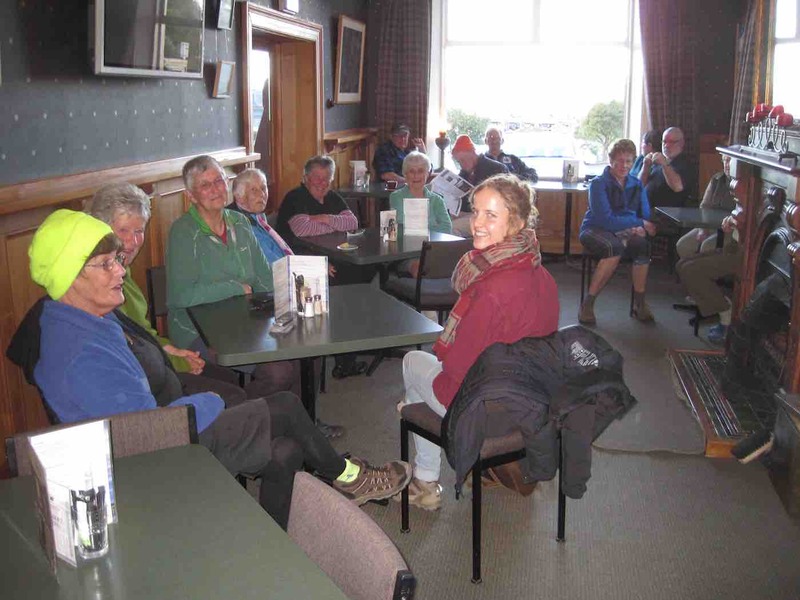 Here, Judy, the leader on the day, suggested that as it was already late, the trampers carry on with what they had planned, & not worry about walking with the hikers. 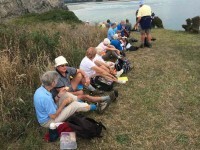 So we took off along the waterside track, & stopped at the picnic spot for a very late morning tea break. Then it was on around the rest of the bay, & into the pine forest on the other side, to try & find the Maori graves in there. 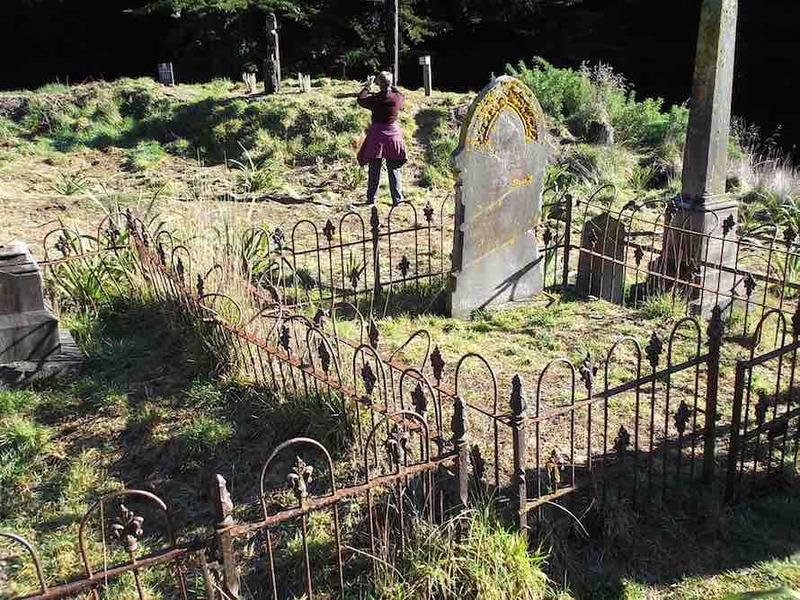 Now I have walked past, & driven past this point many times without realising there were any grave sites in amongst these trees, until about a year ago, when they were mentioned to me. I think most, or all of the other 7 trampers with me didn’t know about them either. 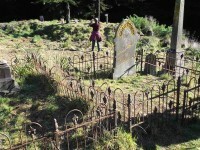 So it was good to find the site & have a look at the few headstones there. 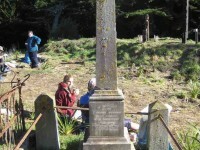 We then went onto the old PA site, had a quick look around, before settling down for lunch. Then it was a quick dash along the beach to the caves on the way to Doctors Point, & back again, before the tide forced a return route over the large rocks halfway along the beach. All that remained was the long road walk, & the bayside track, back to the cars. – Ken. Flooded beach access road deterred Hikers from attempting to reach Canoe Beach. 11. 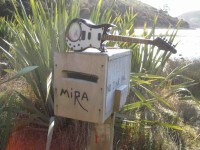 16/4/2008. Hikers. 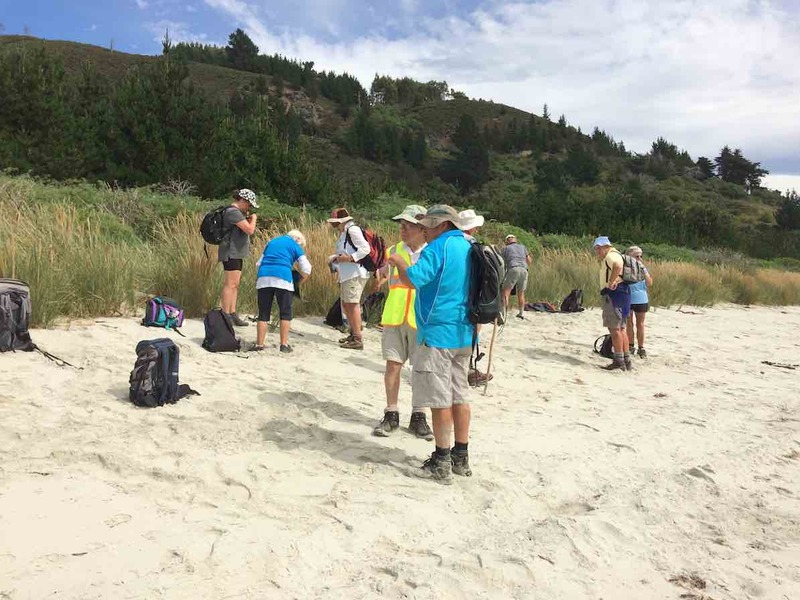 Purakaunui, Canoe Beach. Easy. Park at Picnic Ground. Leaders: Arthur and Barbara. 10. 26/9/2007 Trampers. 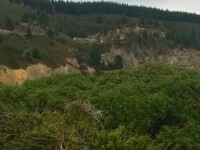 Purakaunui Circuit. Moderate. Leaders: Shirley, Helen. 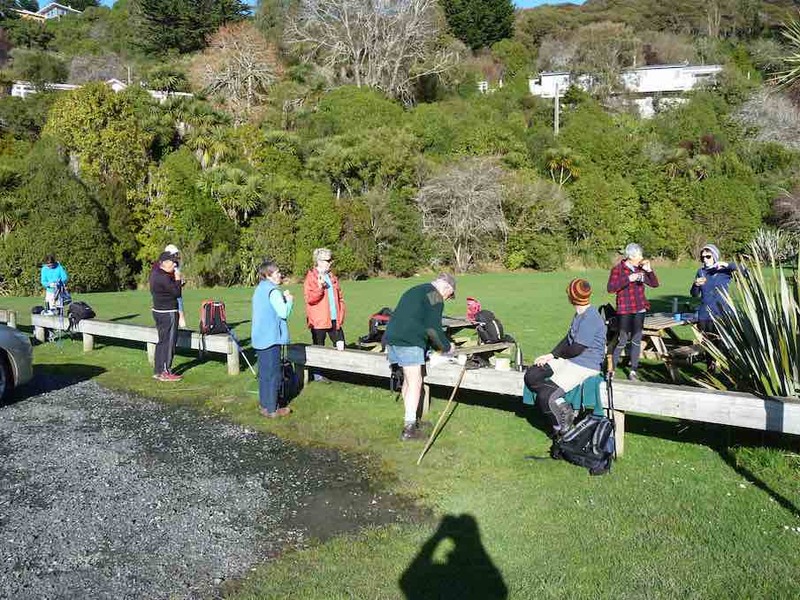 8 trampers met at the wharf at Purakaunui and welcomed Peter back into the fold after his long holiday in Australia. 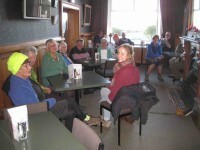 The day started out as rather cold and dreary but soon picked up after morning tea in the park at the head of Purakaunui Inlet. We wound our way around the inlet and over the causeway where the kingfishers love to fish. 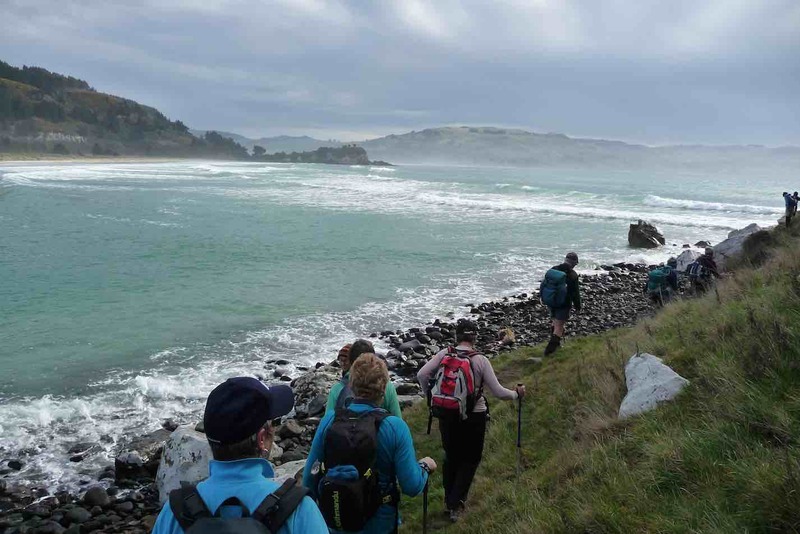 We tramped around the other side of the inlet all the way to Canoe Bay over the steps at the end of Purakaunui beach. Lunch in the sun sitting on the most beautiful beach in the world, before climbing on to the old pa site, Mapoutahi, with views in every direction. 9. 5/4/2006. All. 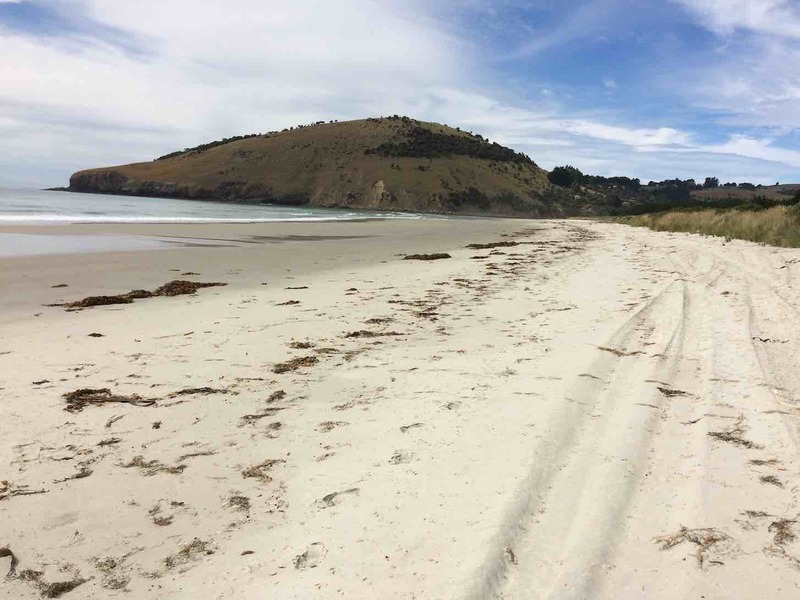 Purakanui, Canoe Beach. Leaders: Doug M, Bob H, Anne R, Eleanor W.
8. 15/9/2004. Both. 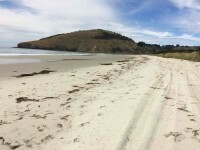 Purakanui, Canoe Beach. Easy. Leaders: Glenys P, Bev H, Les and Margaret. 7. 6/11/2002. All. 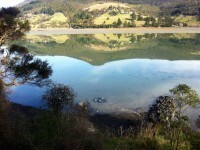 Purakanui, Canoe Beach. Medium. Leaders: Doug M, Betty, Colleen. 6. 1/8/2001. Combined. 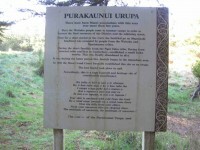 Purekanui – Canoe Beach. Easy. Leaders: Les W, Mary M, Bev H.
5. 3/11/1999. 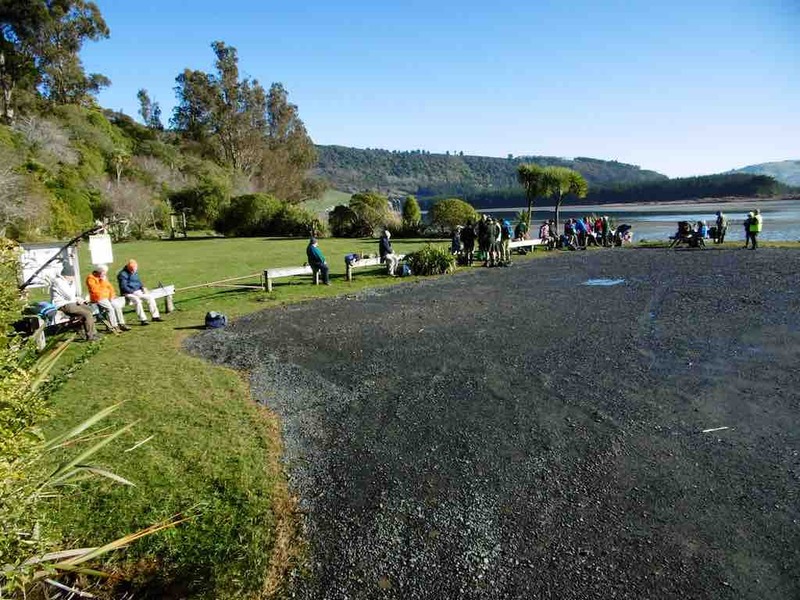 Purakanui – Canoe Beach. Leaders: Doug and Ngaire, Chris. 4. 22/7/1998. Purakanui, Goat Island. Leaders: Doug and Ngaire. 3. 6/8/1997. Purakanui area. 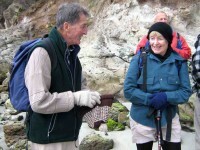 Leaders: Doug and Ngaire, Barbara McC. 2. 1/11/1995. 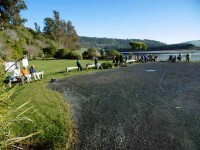 Purakanui – Canoe Beach. Easy. 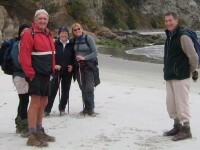 Leaders: Doug and Ngaire, Chris, Joan H.